Blood components are usually transported from Regional Blood Transfusion Centers to supply a hospital with blood products, inventory management by shifting blood components from one storage center to another storage center for utilization (and thereby avoiding outdating), to accompany a patient en-route from one hospital to another hospital or to transport components within a hospital from the blood transfusion services (BTS) to the patient care area (PCA). The transport of components within the hospital from the BTS to the PCA especially red cell components is done with a thumb rule that transfusion of "red cells" issued by the BTS should be initiated within 30 min of receipt and should be completed within 4 h of its issue. It is stored at 2-6°C in the BTS and may be transported in temperature controlled conditions with temperature of 1-10°C. , If the transfusion cannot be initiated in 30 min for some reason, it must be returned back to the 1-6°C storage area immediately. 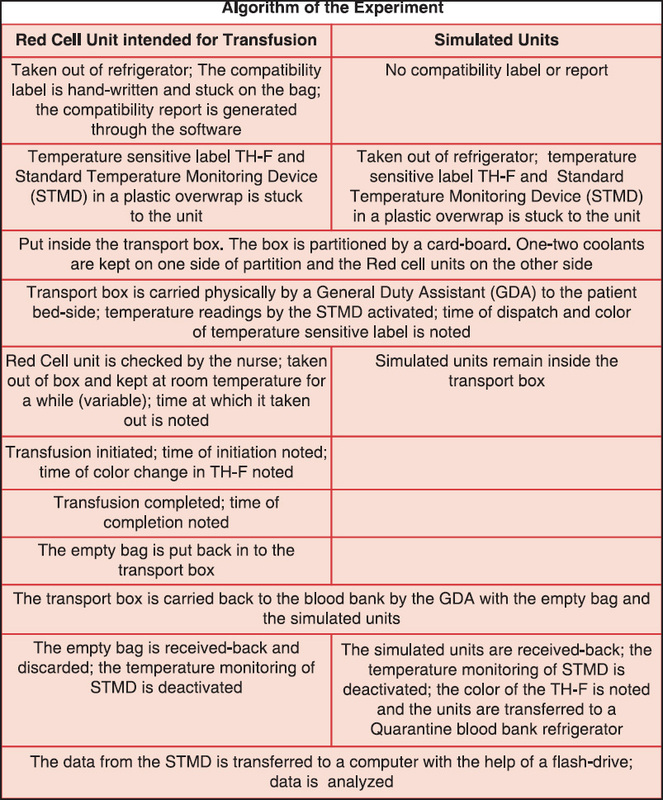 The importance of early initiation of transfusion or early return-back and maintaining the cold chain stems from the fact that a blood unit cannot be used if it has been out of blood bank refrigerator for over 30 min. , This 30-min rule is very useful to guide initiation of transfusion but inadequate for deciding whether to reuse or discard the units received-back at BTS. Only following the 30-min rule may lead to a lot of blood components wastage, which can be possibly salvaged and utilized in other patients, safely. This decision to reuse or discard would only be possible if there was a method available to record the temperature (cold chain maintenance). Such a method would allow in objectively deciding as to which units can be safely reused (where cold chain was uninterrupted) and the others that need to be discarded (where cold chain was interrupted). We therefore evaluated a simple cost-effective method of temperature monitoring, which was used in conjunction with a standard method in a prospective observational study. The simple method was an inexpensive temperature indicator that would change color if the cumulative temperature exceeded 9°C for over 30 min and it was verified with the help of a standard method which was a credit card-sized temperature logger that was attached to the component unit and would give the actual temperature record of the entire journey of a blood component unit. There is no such published report in India. Currently, there is no method of temperature monitoring of a unit issued from the BTS to PCA and therefore the units returned back after 30 min of issue are discarded. For the study, red cells were made from 450 mL whole blood collected from healthy blood donors, in triple bags with 63 mL (citrate phosphate dextrose) anticoagulant. The red cells were prepared by centrifugation of whole blood, removal of plasma and re-suspension of the red blood cells (RBCs) in 100 mL of an additive solution containing sodium chloride, adenine, glucose and mannitol solution. The final component had a hematocrit of 55-65% (0.55-0.65) and a total volume of around 300 mL. 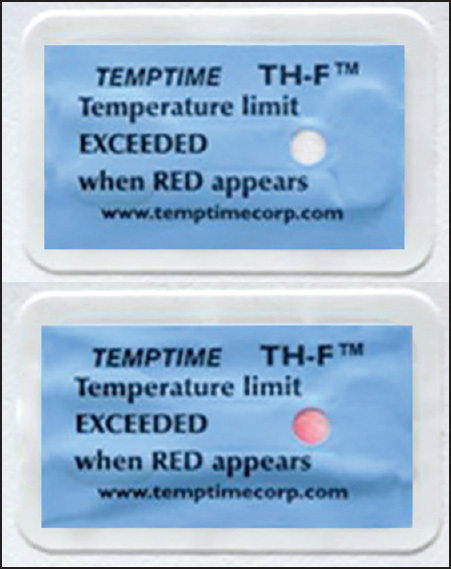 TH-F™ was a single-use time delay threshold Indicator (Temptime Corporation, US) that irreversibly changed color from white to red to signal that a cumulative heat excursion at 9°C for 2 h or less has occurred. The typical time for TH-F to respond at 9°C is about 30 min. This time period will vary from 30 to 180 min depending on the temperature of heat excursion; a higher temperature of say 25°C may change the color in 20 min, while 9°C may do so in 150 min. This is based on a technology where paraffin compounds (crystalline alkyl hydrocarbons) change from solid to liquid. This is formulated to melt at a designated temperature (9°C) which is displayed by a color change from white to red. This temperature indicator is fixed on the surface of the blood bag. The color-change signals that a potentially damaging temperature has been reached. It is easy to read and easy to understand with the color changing from white to red. It does not require any activation and there is no known toxicity of active materials used in product. Temptime Corporation's quality management system is consistent with Food and Drug Administration Quality System Requirement 21 CFR 820 (GMP for medical devices). The standard method was a re-usable credit card sized device called TempTrip (KWIC Healthcare BV, Netherlands), which would log the actual time and temperature. It was attached to the red cell unit and was activated at the time of issue. The calibrated sensor chip (8 kb EEPROM) in the TempTrip would measure the temperature regularly at an interval 30 min during the entire journey (720 readings possible) of the blood unit. A hand-held reader would activate (at the time of issue) and deactivate (at the time of return) the temperature logging and also retrieve the temperature logs. These logs in turn were downloaded in a USB-storage device and transferred to a computer. The measurement accuracy was <±1°C. A simple closed-lid insulated (thermocol) box was used to transport the red cell units. There was a cardboard partition to ensure that the blood units were not in direct contact with the gel-filled coolants, which were pre-frozen at −40°C. The box containing the red cell unit was carried physically by the General Duty Assistant to the PCA. Twenty-five units of red cells intended for transfusion were followed-up from the time of issue from the BTS to the time these were eventually transfused to the patient. Temperature at the time of issue (dispatch from BTS) and color of TH-F was noted. Time at which unit was taken out of the transport box; time of initiation of transfusion, time of color change of TH-F and time of end of transfusion were noted. An instruction sheet was sent advising the duty medical officer to initiate transfusion immediately upon receipt and while the label is still white; explaining to do everything else the way it was being done (follow standard of care) and not to worry if the label turns red, while it is being transfused as eventually every label would turn red in around 30-60 min. For every unit that was sent for transfusion, three-four units not intended for transfusion were sent in the same transport box. These were outdated red cell units. These were called "simulated units" and were used repeatedly in these simulation experiments. The idea was that these units would simulate red cells that sometimes remain unused in a patient for some reason. 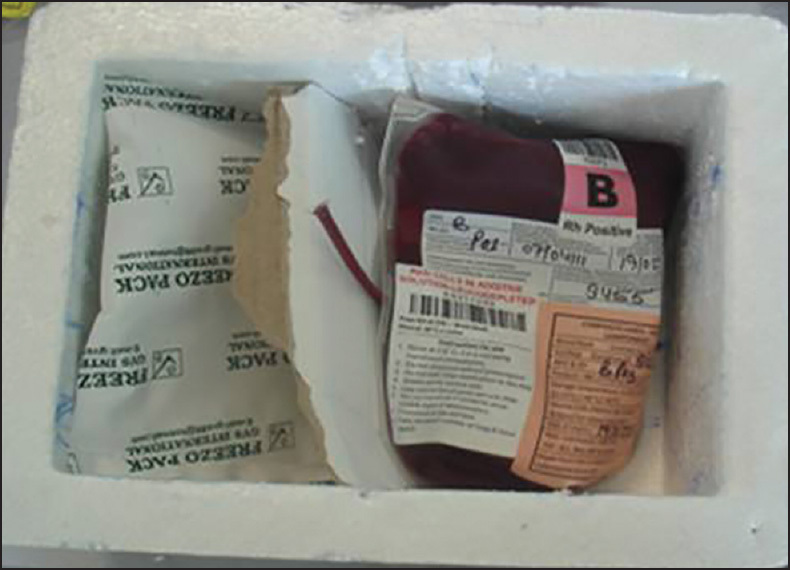 These units remained in the closed-lid insulated box with coolant-pack and were returned to the BTS after the unit intended for transfusion was eventually transfused. Once the unit was received back at the BTS, the color of TH-F was checked at the time of receipt. The bags were stored in the "Quarantine" refrigerator until the next experiment. Time and temperature at the time of issue and return were noted [Figure 4]. Red cell concentrate units were sampled after gentle mixing. Total hemoglobin, supernatant hemoglobin and hematocrit were measured using an automated hematology analyzer. Hemoglobin estimation was performed on an automated hematology analyzer Sysmex XE-2100i alpha N (Sysmex corporation, Japan), which uses a sodium lauryl sulfate hemoglobin detection method. The established linearity range of the instrument is 0-25 g/dl for hemoglobin. The reference hemoglobin method was performed using the Clinical and Laboratory Standards Institute approved method-H15-A3 with International Council for Standardization in Hematology hemoglobin standards. Preventive maintenance included calibration of the instrument using SCS-1000 calibrator from Sysmex Corporation every 6 months. Quality control was performed daily using e-Check (XE) hematology 3 level controls (Sysmex Corporation). Sample size of 100 was computed to test 95% sensitivity of TH-F within 5% margin of error with 95% confidence along with specificity of 80% within 10% margin of errors respectively. Student's t-test was applied to compare any two groups of readings. The study was approved by the Institutional Review Board. As seen in [Table 1], average temperature at the time of issue was 7.36°C with the TH-F label being white. There was an unnecessary practice of keeping units at room temperature for some time before initiating transfusion and this time varied widely. Though on an average the transfusion was initiated in 45 min; the label was white and this constituted the correct practice. 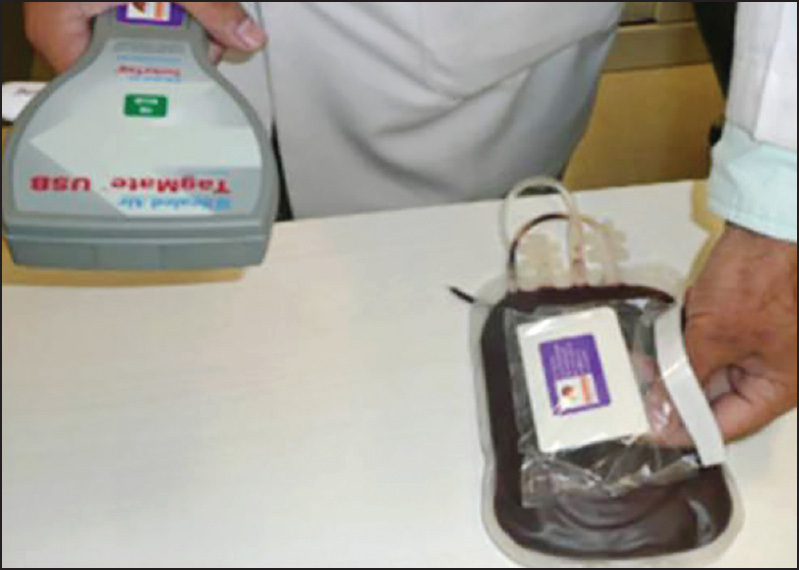 In three cases, initiation of transfusion was delayed to around 2 h when the color of the label had already changed from white to red and this was an incorrect practice. The TH-F labels eventually changed to red in all the units in a little over 1 h (mean 85 min) when the surface temperature reached around 20°C (19.4°C), while transfusion continued for around 4 h.
In the 102 simulated units, the average temperature at the time of issue was 6.24°C and it was 6.28°C at the time of return to BTS [Table 2]. 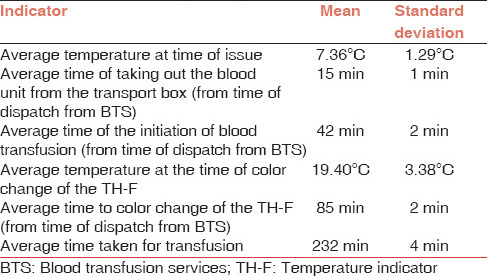 The difference in the temperature at these two points in time was not statistically different despite the fact that these units were in the transport box for over 4 h and simulated real-life situation where certain red cell units remain un-transfused and were returned back to BTS. Supernatant hemoglobin was also estimated in 30 of these simulated units to find out if there has been hemolysis of red cells. The average supernatant hemoglobin in these units was 0.24% (range = 0.17-0.30%), which was much lower than the prescribed limits. The most common transport of blood components is from BTS to the PCA and the guidelines are to initiate transfusion within 30 min of receipt and complete it within 4 h of its issue. However, there is a common and wide-spread practice in wards/intensive-care-units/operation theaters; allowing blood to warm up and reach "body-temperature" or at least close to it, supposedly to avoid adverse reaction in the recipient. This study also encountered this inappropriate practice of allowing blood to warm up before transfusion. The average time to initiate was not within the 30-min rule (42 min) and in three out of 25 units that were transfused it was almost 2 h before the transfusion was initiated. This brings out the fact that there is an acute need to educate the medical/nursing staff to change this practice and clear the misconception that allowing blood to warm up would reduce the adverse reactions. In fact, it could be otherwise. The average time of completing transfusion (232 min) was within the prescribed limits of 4 h.
The temperature at the time of issue was higher than 6°C in units intended for transfusion as well as simulated units (7.36°C and 6.24°C). This could be due to two reasons - one that it generally takes few minutes to paste a compatibility label (which was manual hand-written), generate the appropriate compatibility report which goes along with red cells and finally stick the TH-F label and the STMD. It was lower in case of simulated units (6.24°C vs. 7.36°C) because no compatibility label or report had to be generated for these units. The second reason is that the STMD tend to measure temperature of the surroundings (blood bag is in close contact) which may be different than the core temperature of the unit. This was also brought out by Johnson et al. who said that one temperature-sensitive label fixed to one external location on a container can provide general information but cannot capture the rate of change or change at different locations inside a container of RBCs. However, despite certain inherent limitations of the temperature-sensitive labels, they found these labels to be precise for use in BTS. The 30-min rule is very useful to guide initiation of transfusion but is inadequate for deciding whether to reuse or discard the units received-back at BTS. In fact, only following the 30-min rule may lead to lot of blood component wastages, which can be possibly utilized in other patients safely. A study by Johnson et al. showed that there were instances where un-transfused units were returned after 30 min but the temperature had not reached 10°C. Such units were not discarded in their hospital. They also argued that it is possible that a unit of red cells may be overheated by placing it on hot surface (e.g., microwave heater, radiator or top of refrigerator) but still may be returned within 30 min. This makes the case for using temperature-sensitive labels as an objective tool to decide upon temperature disruption. Johnson et al. used threshold indicators where color change happens the moment temperature exceeded a set value (10°C), whereas our study used the labels which also had a 30-min time delay built in. This meant that the color change would occur when the cumulative temperature is over 9°C for 30 min. Authors strongly feel that these labels are more appropriate for our settings (tropical country) where ambient temperature is much higher as compared to the ambient temperature in US where the aforesaid study was conducted. The safety of using time-delay temperature indicators was further corroborated by the supernatant hemoglobin estimation done in 30 simulated units where the average supernatant hemoglobin was 0.24%. This was much lower than the prescribed limits of Europe  or US. There are several reports ,, including one by the authors  which have proven that there is no significant correlation between hemolysis and interruptions of recommended storage conditions. Interestingly, there is a recent (2012) meta-analysis  which analyzed 23 studies and it reiterates that temperature exposure did not adversely affect the quality of the RBC units or resulted in significant bacterial contamination. The findings of this meta-analysis supports the argument that the units outside the refrigerator (2°C-6°C) but under controlled conditions of an insulated box and monitored with temperature-sensitive labels can possibly be safely used for other patients even if those "30-min" have elapsed. It would be pertinent to mention that though authors used a simple low-cost thermocol box as the "transport box," there are better and more precise insulated transport boxes available commercially that can be used and this would possibly further enhance the robustness of the process of using un-transfused units. When the authors did cost analysis by comparing the expenditure of using TH-F for all red cell units that are issued (24,000 units/annum @ Rs. 30/TH-F label) and savings in terms of red cells that are currently being discarded (360 units/annum @ Rs. 3200/unit) on following the 30-min rule, they found that such universal use of TH-F could potentially save Rs. 430,000 (7855 US dollars) in a year's time, besides saving precious human resource. This study gives us preliminary data which establishes the need for routine use of temperature-sensitive indicators to monitor cold chain for the red cells. Such objective evidence would promote timely initiation of transfusion as well as re-using several un-transfused units which otherwise go waste. The authors would like to express profuse gratitude to Dr. Padam Singh and Ms. Bhavna Alapati for sample size calculation and statistical evaluation of test-results. We also acknowledge the outside support from Temptime Corporation, US and TempTrip (KWIC Healthcare BV, Netherlands) in providing the labels and devices to carry out this trial. Guideline Update, 2009. British Committee for Standards in Haematology Blood Transfusion Taskforce. The administration of blood and blood components and the management of the transfused patient. Transfusion Medicine 1999;9:227-238. Brecher ME, editor. Method 1.1.2: Monitoring temperature during shipment of blood. In: AABB Technical Manual. 15 th ed. Bethesda, MD: American Association of Blood Banks; 2005. p. 722. American Association of Blood Banks. Reference standard 5.1.8A: Requirements for storage, transportation and expiration. In: Standards for Blood Banks and Transfusion Services. 23 rd ed. Bethesda, MD: American Association of Blood Banks; 2005. p. 53. Safe Blood and Blood Products. Distance Learning Materials. Revised ed. Geneva, Switzerland: WHO; 2009. (Marketing & Dissemination, 1211). Brecher ME, editor. Components from whole blood donations. In: AABB Technical Manual. 15 th ed. Bethesda, MD: American Association of Blood Banks; 2005. p. 197. Johnson V, Langeberg A, Taye-Makuria A, Sandler SG. Temperature-sensitive labels for containers of RBCs. Am J Clin Pathol 2006;126:406-10. Council of Europe. Guide to the Preparation, Use and Quality Assurance of Blood Components. 9 th ed. Strasbourg, France: Council of Europe Publishing; 2003. FDA Summary Basis of Approval for Red Blood Cells Frozen and Red Blood Cells Deglycerolized (Reference Number 86-0335). US License Number 635-10. Bethesda, MD: Applicant-Department of the Navy, Navy Hospital; 1986. Zimmermann R, Heidenreich D, Weisbach V, Zingsem J, Neidhardt B, Eckstein R. In vitro quality control of red blood cell concentrates outdated in clinical practice. Transfus Clin Biol 2003;10:275-83. Tiwari AK, Shah P, Harimoorthy V. Estimation of supernatant hemoglobin in red cell units with and without temperature interruptions. Indian J Pathol Microbiol 2007;50:437-40. Weiss DR, Fortenbacher S, Ringwald J, Strasser EF, Zimmermann R, Eckstein R. Transitory interruption of recommended storage conditions does not cause significant changes in in vitro parameters of leucocyte-depleted red blood cells. Vox Sang 2011;100:272-8. Brunskill S, Thomas S, Whitmore E, McDonald CP, Dorée C, Hopewell S, et al. What is the maximum time that a unit of red blood cells can be safely left out of controlled temperature storage? Transfus Med Rev 2012;26:209-2233.